Welcome to the Wasteland, Survivor! Now, we know it’s a bit jarring to see your new home in such a state, but we’re here to help you come to terms with the post-nuclear journey that lays before you and figure out where to go next! For example, have you ever fought a Deathclaw?? Been irradiated before? The possibilities are truly endless, so rip up that bucket list you’ve been working on. It’s time to start fresh. For example… instead of meeting celebrities, you can now meet raiders! And with the majority of Boston in shambles, you absolutely must check out the delightful, synth-hating community of Diamond City. Isn’t the apocalypse fun? In order to master anything, you’re going to need some practice, so we at Vault-Tec have partnered with Fantasy Flight Games to create Fallout: The Board Game, a one-to-four participant Wasteland tutorial in tabletop form. This fabulously dangerous recreation of the irradiated wastes will teach you step by misstep exactly where raiders like to set their mines, how not to pick a fight with a super mutant, and what an utter inconvenience it is to get addicted to chems. 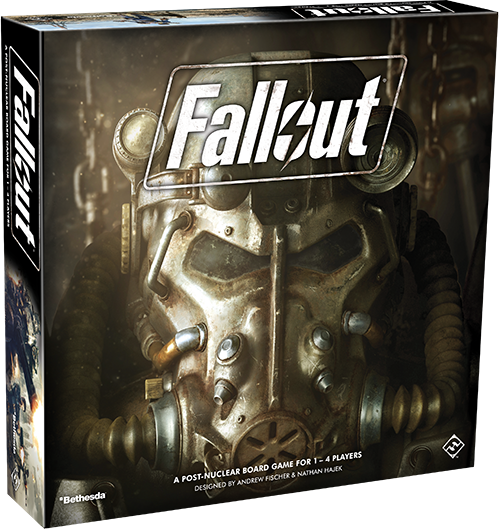 Even better, you can pre-order the tabletop simulation of Fallout on the Fantasy Flight Games website now! There’s nothing quite like preparing to prepare for the aftermath of nuclear war, so let's dive into the basics of Fallout! Your first steps into the Wasteland will be among the most exhilarating and uncertain you’ll ever take. Everything you thought you knew will have changed. Sure, you’ll have your major landmarks, like Diamond City, which sits amongst the ruins of Boston, or Megaton, just outside what was formerly Washington D.C., but everything surrounding these has been consumed by the land and reshaped by radiation. As you wander the new landscape, you’ll hear whispers of the settlements, ruins, and vaults that represent this new world of yours, but to simulate your crippling uncertainty, the tabletop training module will vary with each and every test. You may stumble upon one of our shiny steel Vault-Tec doors during one game, but that same spot will feature the unlit shell of a Red Rocket station in the next. Not only that, but half of the board is decidedly more scary than the rest, indicated by game tiles in the unforgettable shade: Enter-At-Your-Own-Risk Red. Once you know what you’re up against, it may not feel so scary, but you can never be fully prepared for what lies ahead. The majority of the map will be shrouded in mystery so you can't see what’s ahead until you Explore it. To do this, you will have to Move across the map, running all-but-blindly into areas featuring tough terrain and heavy radiation. Oh, and radroaches. Big, scary radroaches. Gallivanting around, exploring the unexplored is certainly a tried and true strategy in previous Fallout simulations, but as any seasoned Wastelander will tell you, it’s not without its risks. This world lacks anything you could reasonably call a “safe zone,” so you must always be prepared to take on the aforementioned radroaches (among other truck-sized creatures). Some enemies can be rushed past and momentarily brushed off, but others are more aggressive, attacking before you even have time to stow away your dog-eared copy of Guns and Bullets. When you Fight a creature—no matter who started it—you roll your three VATS dice, hoping to hit your opponent in their vulnerable spots more times than their armor can repel. You must also hope their hits don't exceed your own armor's strength. The damage done in the fight is all recorded on the dice, so if you’re able to reroll with a weapon or another ability, you may increase your contribution to the fight or try to avoid a strong attack from your ill-fated enemy. On the bright side, if you win the fight, you gain XP equal to the level of your opponent and perhaps some well-earned loot from their corpse. On the less bright side, if you lose, you get squat, and probably lose some treasured HP. It's a good thing you have at least two arms. If you’ve successfully avoided or eliminated nearby enemies, you also have the opportunity to Encounter locations. Earlier, you explored some settlements, ruins, and vaults, and now you can head on in and say hello. Perhaps you will find yourself competing for loot at a raider camp, or getting wrapped up in a local spat about synths, or maybe even get yourself hoodwinked by a crude and very obvious trap (seriously, how did you not see that one coming?). 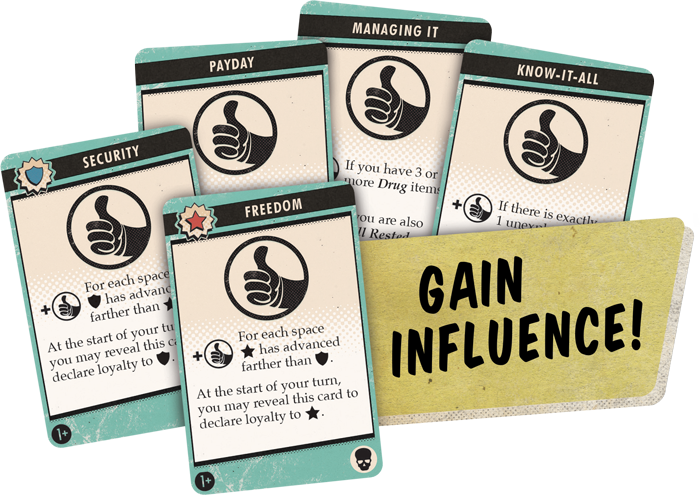 Whatever monkey business you get up to, you’ll have a choice to make—a choice that will shape the story of the Wasteland around you and may have some unintended consequences later in the game. So thanks for that. Quests are similar to Encounters, however, the immediate results of these choices are visible to every survivor, and you are all able to Quest, moving the objectives forward. Each training scenario begins with a main quest, related to the two factions you’ll meet during your travels. When you complete one of the tasks on a quest card, or perform the Quest action, the story will move forward, along with the associated faction’s power token. By creating an alliance with the more powerful faction, you can benefit from their success. However, you can't get too comfortable, or those allied with the other faction may take control of the Wasteland while your back is turned. As the main story progresses, other quests will also become available, presenting even more goals you can seek to achieve across the map. While these will no longer influence the factions, they can have lasting effects on the state of the Wasteland, much like encounters. Completing the requirements of these quests also provides additional opportunities to gain XP, loot, influence, and more. Superfluous side-questing is yet another strategy beloved by many experienced survivors. After all of that busyness, it’s time for a well-deserved break! Though the emptiness of the Wasteland can be a bit lonely, it also means there is no shortage of you-time. Itching to break out that ratty copy of Grognak you found along the way? Take a load off in charred trailer or an empty bunker. Not only will a Rest give your mind a break from all of the exciting new lessons you’ve learned, but it will also give your body some time to recuperate and your companions time to recharge their batteries (sometimes literally). A rested survivor is a happy survivor, especially after they’ve obtained a Well-Rested token, which can be discarded later in exchange for a re-roll of the dice. With these six tools in your arsenal—Move, Explore, Fight, Encounter, Quest, and Rest—you will be a force to be reckoned with in no time. Vault doors will open at the sheer whisper of your name; dogs will flock from miles around just to be your Dogmeat; super mutants will want to be you, and companions will want to be with you! You, my friend, can rule the Wasteland with just a few hours, a little luck, and a lot of influence points. The Fallout board game (ZX02) is available for pre-order now, so visit your local game store to let your Vault-Tec Representative know that you’d like to register for a Wasteland adventure of your own or order your copy on our website!